she can laugh at the days to come." This was not the post I had planned to write today. However, this is the post that is begging to be set free from my heart today. This week a saint passed away--Lem's grandmother. Or, as we called her, "Granny". As I sat through her funeral yesterday, crying a river of tears, I could not help but to think of how her life impacted mine. Dramatically. Not only did her life impact mine, but many others. The funny thing is, she didn't make it a goal of hers to "impact lives", she just did. I have never known anyone quite like this lady. Ever. When I think of our memory verse---"Do not conform any longer to the pattern of this world, but be transformed by the renewing of your mind." Romans 12:2 , her face appears. She was the opposite of this world. She was acceptance--of all people. The one adjective that sums her up the most is "content". In this world, contentment is a rare jewel. It shines when it's on display and portrayed. Yet, it's rarely seen in a world that hungers for more, more, more. When someone dies, life has a way of beginning. Death can be a gift in the most unusual sense. Death can bring perspective on our lives. Death can infuse us with the desire to live fuller lives. Death can draw us closer to others, because of the reality of the preciousness of our time. Death can revive our spirits and bring oxygen to our often dried-up soul. When we live our days in "robot" mode, we miss the gift of life. We miss the beauty of creation that surrounds us. When we choose to be content in the present, we gain more treasure than our hearts can hold. So much that it spills out to those around us. Overflowing treasure. 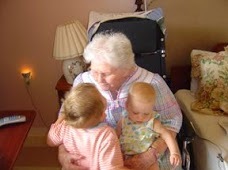 Granny exuded peace because her heart was at rest in the present. Never looking back, or anxious looking forward. The world may not know our Granny, but the treasures she left behind will outlive this world. Granny didn't want to be noticed, she just wanted to make others happy. She was content with who she was, what she had, and desired nothing more. Choose today what your legacy will be. Start living it out today. Don't wait until a loved one passes to "change" your life. Do it now. Instead of conforming to the worlds ways, conform to contentment. No matter where you are on this journey of life, I can almost guarantee that Granny had been there. Granny lived 95 long years. More years than every single one of us. She suffered great loss. She suffered great heartache. Yet, she chose contentment. What will your legacy be? Will it outlive this world? I pray it will.